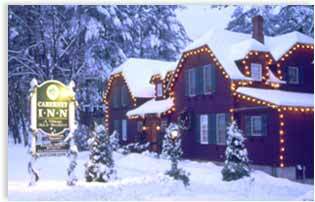 Superb service, engaging hosts, and sumptuous breakfasts make this romantic and elegant 1842 inn unforgettable. 11 exquisitely maintained guestrooms feature queen beds, private baths, in-room fireplaces and jacuzzi tubs. Quiet sitting room for reading, plus ample gathering room for games or television, each with wood-burning fireplace. Easy access to skiing, hiking, mountain biking, outlet shopping. Cross country ski from our back door. Completely smoke-free and handicapped accessible. We cater to discerning travelers who appreciate exceptional accommodations. FREE cross country skiing and snowshoeing!